I was so excited about this class, I have followed Finnabair since before she was famous but had never taken part in one of her classes. So this week we were taught how to make a steampunk box using her techniques. I chose to use a wooden box from The Works to work on. We used modelling paste to make lots of texture. Then built up our Steampunk look using anything we could find. an electric die cutting machine. the other metal and wooden pieces. For my centre piece I used a fake pocket watch I had had for years and added some real watch parts to add interest. I then painted it up with layers and layers and layers of paint. It was then finished off with different coloured waxes. This was quite a project but I am pleased with how it turned out. This course is getting better and better! New month, new theme and it’s one of my favourites Steampunk!! There are some very exciting classes this month, which might take a while to finish. The first class was a fun one though, our teacher is our host as well, Kasia Avey. We were given lots of fun Steampunkie images and asked to invent something in the mad scientist Steampunk style using them. I think it’s some kind of holiday house? Compleate with entertainment in the form of a musical octopus who also takes the holiday snaps for your album. like a change of scenery, you can then bicycle your way there. Of course the hot air balloons have propellers so it is not to much like hard work. Wanderlust online course - week 12 - Theme rivers - Teacher Kasia Avery. This weeks page was concentrating on enjoying the process of making the page and not always expecting a finishe page at the end of it. So we made a pull out book made of different papers and fabric which represents a river. We then added stones to dangle below and painted the background of our book. The book was added to the page and the background of the page painted. Then we had to stop! I also made some of my own tape to add to my page and used some paper beads I had made ages ago. Later we can go back to our river page and continue the process. We have been given prompts to pick at random with ideas for the next few layers untill it is eventually finished, when ever that may be! It feels funny showing you a page half finished but I will post the finished page whenever it is finished. Wanderlust week 11. The theme is rivers and the teacher was the wonderful Laly Mille. I had done a few things with her online before so I knew it would be fun. We used loads of different mediums on the page got very very wet! My poor home made journal needed a bit of repair after the class. I like the result but I think I over worked it a bit too much. Always a hard job to know when to stop. I am way behind on my posting for my Wanderlust course. For the month of March the theme was rivers. Here is my page made for the Clair Etheridge class. I even astonished myself and drew the dragonfly and beetle myself!! We made the collage papers that we then tore up to make our page. Loved this class!! Can you believe how fast this year is going? Spring is here and Easter just around the corner! have made for The Fruit Pixie online shop. I stamped the sweet little rabbits onto white card using brown archival ink. Then used my watercolour paints to paint the background and stamped images. couple of the Craft Consortium enamel dots to finish it off. their beautiful Washi tape and the cutest little pine cone charms you have ever seen in The Fruit Pixie online shop here! and other water based colour without you stamped image bleeding. As I have said before, hubby gave me the year long Wanderlust mixed media art journaling online course for Christmas. I am having a ball!! Each month we have a theme and the theme for March is rivers. Every Friday we get a full video class from different teachers. Week 9 was taught by the founder of Wanderlust Kasia Avery. The theme for the page was rivers of your heart. Now, I could tell you that the page just magically flowed out onto the page and some pages do. But not this one! We live in a world now where everyone is an expert, often without any experience. You always see the perfect end result but without hearing the fact that it took them 10 attempts to get there. I have been art journaling for many years and making a lot of pages but the first attempt of this page was a total disaster. In the teachers page she showed how to do an image transfer with gel medium. I had done this technique many times before but the difference this time was the fact that my gel medium, which isn’t my favourite product to be honest, had all but dried up. But I tried it anyway and of course it didn’t work so I had a horrible black smudgy mess instead. No problem! I just glued the pages together and started again. I worked away all day on my page but at the end of the day I hated it! The colours were all wrong and it just looked a mess. I did sleep on it but agreed the next day, it had to go!!! So I carefully ripped one page out and glued in a replacement page. Luckily I had made my journal and I just happened to be at the end of a signature so I had enough space for it to work. I then changed the design completely but kept the essence of the class, changed it to rivers of my life and really enjoyed making it. So what I am trying to say is never get put off by things that don’t work or like mine are a total disaster! Just give it another go, it’s only a piece of paper at the end of the day. If you are interested in my rivers, the Salzach, Inn and Danube are in Austria and I was born and still live in Bristol, where the river Avon runs out into the Bristol Channel. I love organising my Arty things, using unusual containers or decorating blanks. This little pot is a wooden blank from The Works. I began by painting the pot on the outside white and inside pink. The white paint helps the colour of the decoupage paper shine through. I covered the middle heart with the lovely Cosmic Shimmer silk glitter. The heart pops out so you can add a photo if you like. Once everything was dry I then covered the outside with the Craft Consortium decoupage paper Travel stamp paper. Everything, except the pot, is available from The Fruit Pixie online shop, who I design for. For Christmas I had the Wanderlust art journaling course from Hubby. 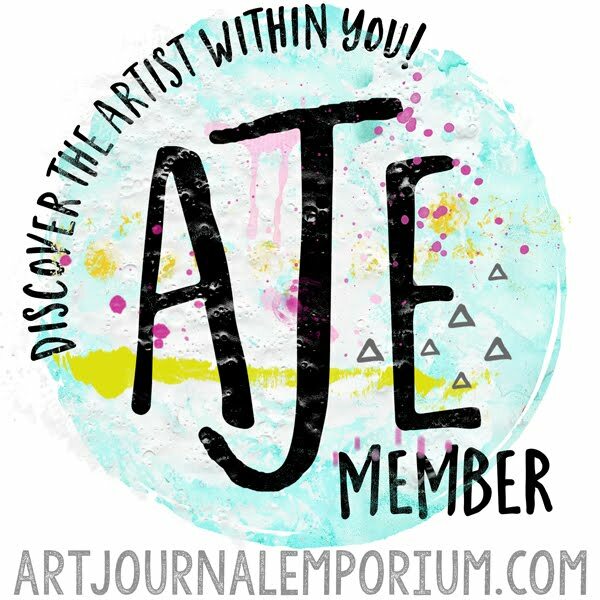 A year long online art journaling based course. Each week there is a new class every Friday. I am now at week 6 and I must admit I am having a ball!! Each month there is a new theme. January was Typography ( my other projects can be found on my Instagram ) and this month February is Faces. Not the theme I was looking forward to but it has been fine. Here is my page for week 6. The class was taught by Marjie Kemper and used sprays, stamps and stencils. Just my sort of thing and I hadn’t used my sprays for ages! I learnt by accident that if you used the Sparkle texture paste by Cosmic Shimmer and then, when dry, spray it with your sprays you get this beautiful effect. The colour pools on the paste. I used the silver texture paste for the tags. Such a fun page to make and I am really pleased with how it turned out too. Hello! I’m back in blogging land again. I have been AWOL for a while due to technical reasons but now I have sorted it out and am back! This time I have a cute little card I made for The Fruit Pixie, who I design for. This is a penny slider card made using the Craft Consortium Little Fawn and friends papers. This is such a fun little card. The squirrel spins and slides around the card chasing his acorns! It feels so good to be back again in blog Land! Thanks for visiting, I’ll be back with another project very soon. I have skipped a few of the challenges of the Stencilfied journal challenge as I couldn’t really do them due to the products I have used or the lack of stencils. StencilGirl stencils are not easy to get hold of here in the U.K. and the postage from the States is more than the price of a heap of stencils but I have just about managed with the StencilGirl stencils I can buy here and am now on challenge 14. Now this looked quite straight forward until I looked through my StencilGirl stencil collection and found that every single stencil bar 1, which was one of the large multi pattern stencil, had curved lines! Plus I love this quote!